A Sketch of the Public Surveys in Wisconsin. 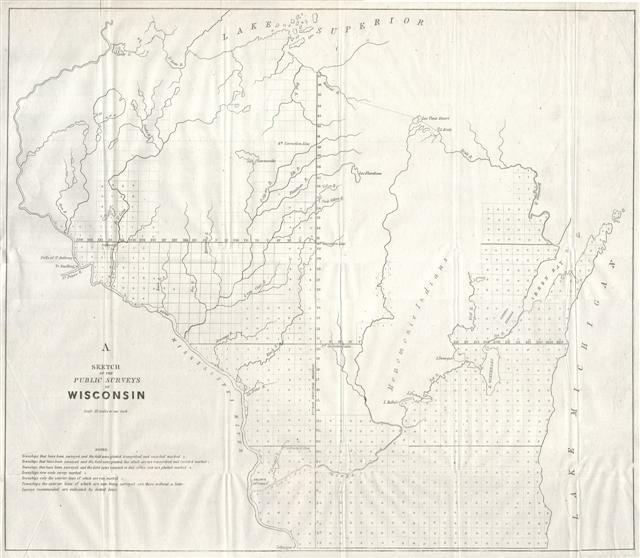 This magnificent map of Wisconsin was issued in 1848 for the U.S. Land Survey Office. It is officially entitled 'A Sketch of the Public Surveys in Wisconsin.' This large map reveals the State of Wisconsin in wonderful detail, including numerous historically important references, including but not limited to Oneida Indian and Memomonie Indian territory, geographic features such are falls and rivers, and important forts and settlements such as Fort Snelling and Prairie de Chien. Minor marginal splits repaired, otherwise fine condition with no discolorations or other damage.